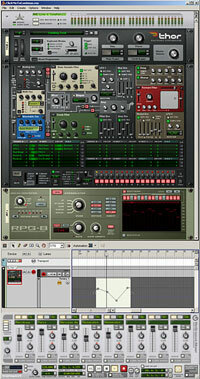 Tuesday, June 19th, 2007 | 5:22 am	and filed in Reason, Propellerhead. It’s been months since the sneak preview of Thor was announced at the winter NAMM show. Finally the speculation is over and the anticipation begins as Propellerhead Software Announces Reason 4! Besides the new synthesizer, THOR, the upcoming release will include the RPG-8 arpeggiator, new transport interface and features, a new sequencer with improved automation features, and a new groove quantization system. Did I not previously say that this would be an exciting month for Reason Users Worldwide? « Thank You Denmark, Italy, and the UK!